When you’ve had a bad year for 103 years, what would you do to turn things around? It’s practically incomprehensible for us to relate to a question like this because while a business can have a bad month, bad quarter or – in this economy – a bad year, we usually don’t know what it’s like to have consecutive bad decades. How does one find this elusive culture of winning? Well, I think organizations searching for that may be able to learn a few things from Epstein based on his past stop and already what he’s doing here. And if you’re a Cubs fan, you should be encouraged by this too. Let me explain with 6 key observations. 1) Visions have to be clear, concrete and more specific, not broad core values nobody can understand. 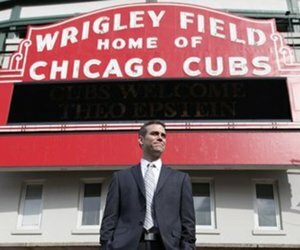 What I find refreshing about Epstein is that, when he announced the search for a new manager, he let everyone know exactly who he was looking for in a candidate – one of those aspects being that the manager had to be someone with major league experience. For better or worse, that immediately ruled out hometown favorite and popular choice Ryne Sandberg. But when you leave no doubt as to what you’re looking for in an organization as far as the kind of talent that belongs (and doesn’t belong), then you set a strong tone that people can get behind. The same holds true for your customers – you can’t be for anybody with a buck. So who are you for? And not for? Do your people get that too? 2) Locate the cancers in the environment as quickly as possible. Then remove them. You can give someone with a poor attitude the chance to turn that attitude around (warnings, probation). But if they don’t, they should be removed before the cancer spreads. I have seen environments where some people had become so jaded with “that’s the way it always is” and “we’ve always done it this way” and that’ll never work” statements that it permeates throughout the rest of the culture. You can’t build a winning culture with people that way and it doesn’t take many of them. And the more you make excuses for people who don’t deserve a free pass, the more others will be impacted. In relation to the Cubs, this is why Carlos Zambrano will probably never pitch at Wrigley again, unless in an opposing team’s uniform. 3) Winning cultures have to be accountable. My colleague, friend and co-presenter Rob Jager of Hedgehog Consulting often speaks of this. Managers can speak all they want about how employees should do this or that, but if they don’t follow the same practices, the words coming out of their mouth have significantly less meaning. If someone is a nice person who doesn’t produce (and assuming they’re in the role they’re supposed to be in), they too should be removed. Mike Quade is probably a nice enough fellow, but the team’s fundamentals on defense were horrible. That points to poor management and is a big reason why Epstein wiped the slate clean by deciding, in order to have a winning environment, a change needed to be made. In the next post, I’ll provide 3 more cultural changes you can make based on how Theo might run your organization.